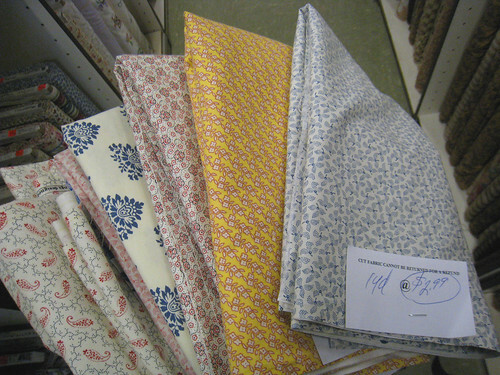 My mom gave me a great tip to a discount fabric source in Maine. Marden’s Surplus & Salvage stores are known for amazing home bargains and deals. 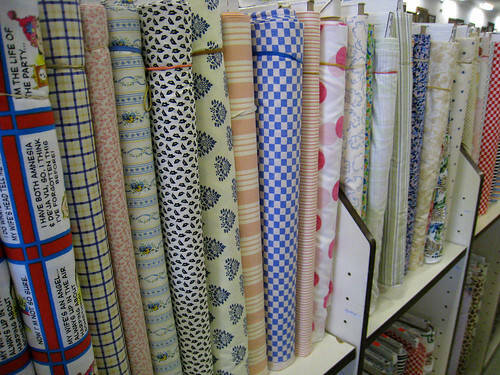 Unbelievably this discount store carries an great selection of quilt shop quality fabrics. Most of the fabrics are about $2.99 a yard. I picked up some super adorable cotton prints for my pillow projects. Check out the blue floral by Michael Miller in the middle of my stack. The fabric was featured in one of the last issues of domino. I got it for $2.40/yard. Amazing! Oh my gosh…I love Mardens!!! They have great material at great prices that no one can beat. It is a must for sewers and quilters. Thanks for the tip, Katy! I'll be up in Maine in July and will definitely check it out. I've been looking for fabric to reupholster some old chairs that I'm refinishing. Everything I've found has either been way too expensive or way too hideous. Thanks for the tip! Such a treat finding a bargain. Love your picks! I love the Michael Miller fabric! I've used it for pillows too! This looks like a fantastic place.